The music of SONIC DEVIANT will be played before the show. Thanks to Dave Slack for featuring my tunes as his opening act. Dave told me he played four tunes, including Feline Demise off the upcoming album, Transduction Euphony. I wish I could have been there to see the show! For those who haven't checked out BMR3000, do it NOW! Some of the tunes have been featured on several podcasts over the last few months. We weren't aware, but East Wind Blows West was featured on the BareFT podcast episode 58. 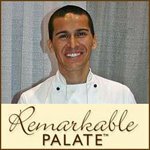 Our friend, Chef Mark Tafoya, has made great use of Coffee Bean on several of his podcasts. The tune appeared on two November episodes: 66 (The Wines of Rioja, Part 2) and 64 (Cranberry Time!) of the ReMARKable Palate podcast. Mark also featured the same tune back in October. 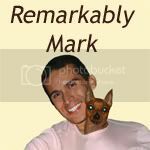 He also featured Coffee Bean on his personal blog, Remarkably Mark, in episode 33: Tapas Crawl in Spain of November 5, 2006. Thanks for all the support Mark! Don't Want To Go appeared on Mad Money Machine's MMM-045: Should I Risk Exposure of October 31, 2006. 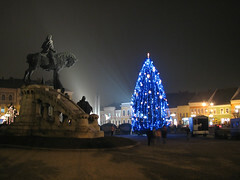 I wanted to wish everyone a Merry Christmas, Happy Hannukah, and <insert your observed winter solstice holiday here>!. Feline Demise was updated with a remix/remaster featuring MORE BASS. Enjoy. Also, we've completely updated the main site, as well as myspace (much bug squashing there and here on the blog--some missing images and other browser formatting errors should be addressed now). We've added two new pages. One will be used to update all places on the Internet where we'll host tunes for listening and download. The other lists all the professional services we offer, including inexpensive, high-quality mastering for your 2-track mixes. Transduction Euphony is coming along and will hopefully be shipped for manufacture by mid-January. Shane's tune Under the Stairs from Celestial Icons' 1993 album Timid Blue Planet (featuring drummer Alberto Vargas) appeared on The Word Nerds podcast episode 81 (Prepositions). Thanks to Dave Shepherd et al. for using the tune on their show! Sibelius makes music notation software that is widely used by musicians for movies and songs and by scho. Avid Technology now owns Digidesign (ahem...ProTools), M-Audio (midi controllers and other music hardware/software), and now Sibelius (a top notation program). I fear companies that become too monopolistic. More to come as my new album is finished...tentatively titled Transduction Euphony.